Our annual Free 90 minutes seminar is this Saturday February 26th! o Dogs must be up to date on Vaccines and have current Rabies Tag. o Dogs must be well behaved, friendly and socialized. o You and Your Dog HAVE FUN TOGETHER! 1. Water and water Bowl for your dog. 2. Towels (may need to wipe feet before entry to car after training session). 3. Clicker if you have (or you may purchase one from us). 4. Dog’s Favorite Treats & Toy(s) for Positive Reinforcement. o Either do not feed before class, or feed lightly (2) hours before, especially if using food reward. o Good idea to exercise dog before training session, so more calm for learning. o Contact us before class if you have any questions. o If feeding dog after class, wait at least (2) hours. What about a FREE 90 minutes seminar with us on How you can live a longer and Happier life with your dog? A $59 value this Saturday February 26th at 9 am. Where: Sunview Park, (Soccer Field) 1500 S.W. 42nd Ave., Fort Lauderdale (near corner of U.S. 441 and Davie Boulevard). WHY? It’s a fact that dogs need physical and mental stimulation. Trained or not, but must have vaccinations up to date and be social with people and other dogs. Agility, Fly Ball, Rally, Obedience and Rescue dogs welcome. Please bring plenty of water, toys, treats and your SMILE! Guests will participate in all working stations during the session. And who knows, you might be selected as a member of the team for our National family entertainment dog extravaganza! Boot Camp with American IDOGS! The new way to have fun with your dog! – Large and small–we want them all! Rescues, mutts, and purebreds, show us your stuff! – Advance training! Cute or not! Tricks ~ Freestyle ~ Jumping ~ Relay ~ Extreme obedience, Canine Musical Freestyle and more. More exercise for both of you! Better bonding between dog and owner. Dog will learn to socialize with other dogs and people. A great place to meet new friends who have the same passion as you. Dog and owner will learn to work as a team.Þ Gain a smarter, happier dog. Impress your friends with your dog’s new tricks! Great for the both of you to stay in shape. 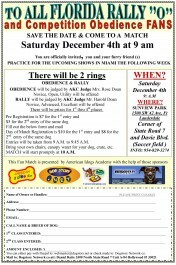 And who knows, you might be selected to become a member of American Idogs national team member and perform in our show. Non aggressive dog, no prong, choke or other restrictive method will be allowed. All vaccine must be up to date. Any dog up to 8 years old of any breed or size. Rescue more than welcome. Humans from teenager (with authorization) to senior in good physical condition. Dog with no obedience training are not accepted, and will be referred to one of our regular obedience classes. Click training and positive reinforcement. Obedience reinforcement: walk, run, basic training practice in team pair or solo. Basic long and high jump and basic agility trial. Routine and trick creation in team. Long sit, long stay with distraction. Fetch ball and plush toy. Introduction to side and back walk. Introduction to Musical chair and magic ring. Introduction to barrel racing, tunnel, ring and A-frame. Basic of canine musical freestyle. All members will do all working stations during the session. The test at the end of level one will include a mix of all basic exercises learned in session one. Those who fail the test will be able to retake this session at 60% off or assist as a volunteer in level two, demo, Elite level or shows to gain more experience. Limit of 20 inscriptions per session. 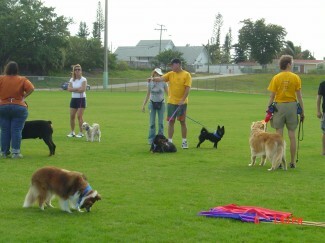 We offer exciting new dog training at Sunview Park and Central Broward Regional Park of Broward county Florida. Obedience class teach your dog what you want him to learn without prong or choke collars. Learn shaping and positive reinforcement techniques. At American Idogs Academy we will help your dog with one of his biggest problem…YOU! Yes, dog training can be difficult. It’s a lot like raising children in some ways – it requires some patience and doesn’t always happen as quickly as we’d like. So we will help you to teach him. And if you really take the time to try to understand how your pet thinks, you can make sure that your relationship will have a better ending. Don’t forget that if you learn what “makes them tick,” then the process of dog training will be much simpler and much more successful. And who knows? If you’re having amazing progress you could become one of our AMERICAN-IDOGS Elite show team members! Other programs are also available. Sunview Park From 9:00 A.M. – 11 A.M.
Bring all your furry friends!